Here’s the Final Prayer of The St. Peregrine Novena for Cancer Patients! Prayed exclusively for a friend with stage 4 cancer and my father who’s red blood cell count had become dangerously low. I saw Kathleen the other day and she looked terrific and never would’ve known she was sick! My father’s red blood cell count had risen as well! Thank you St. Peregrine for your intercession!!! I prayed the St. 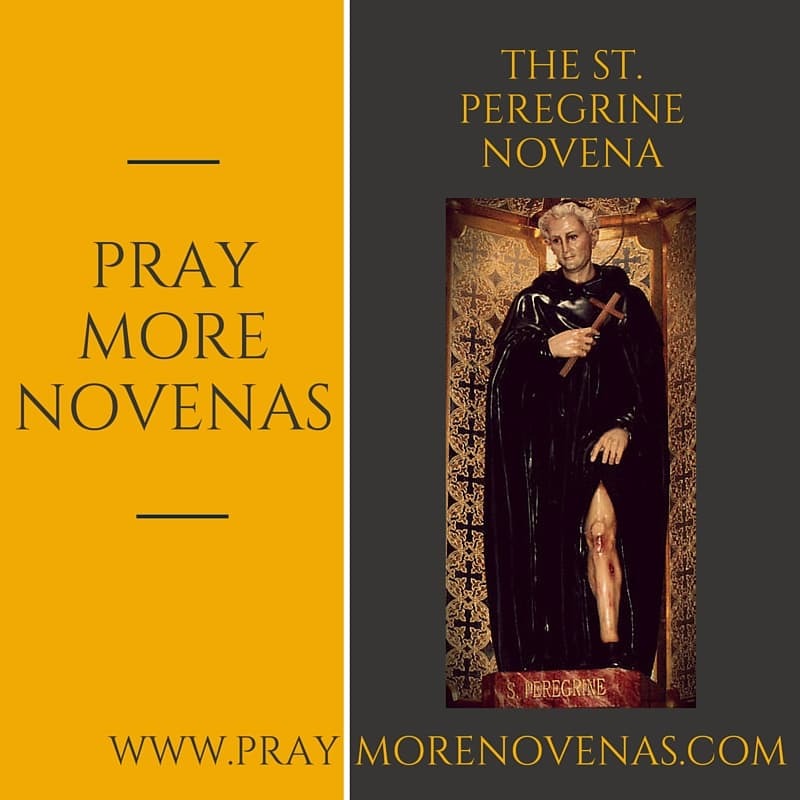 Peregrine Novena for 2 of my friends, one with liver cancer and the other pancreatic cancer. The one with liver cancer has been on the transplant list for a couple years now and during the novena the hospital called him and said they had a liver for him! Praise God! The transplant thus far was a complete success! God is good all the time! Thank you God for all you do. Pray for Health and happiness for all my family and friends. Make me less anxious but thank you for helping me reject benzos and other pills leaving me with just small dosage at night. In the name of the father. Amen. Thank you St. Peregrine for prayers answered. I continue in remission. Scans show no Cancer. Also, my son visited with me. After starting this novena, a few days later, My cousin’s husband woke up from a coma! Thank fir everyone prayers! Soon will start another novena because now my cousin Erik has been found with nodules around his thyroid n are being biopsied ! Keep him in prayer! I love n believe believe believe in praying novenas! I am so glad I found you’ll???????????????????? Did Lord Jesus, there are 2 people whom I love who are now inflicted with this dreaded disease. Please help them go into remission so they can be with us a while longer for you will have them in heaven for eternity. We only get them for a few years. I’ve already lost my Sister to this disease, please don’t let me lose these two wonderful people, especially at this time. I believe in you Lord Jesus, and know if it be your will, you will make it happen as you can do anything. I pray Through Jesus Christ our Lord, Amen. After drinking half a bottle of whiskey most days, I ruined my health that had been restored by God. I prayed that I loose my desire for alcohol and I haven’t drank in 9 days. Now I must work to get healthy again with the help of our Lord. Thank you St. Peregrine. Saint Peregrine, please pray with me for the health of Joan, Gloria and Ilse. It’s really important that these three women become well again. Thank you. Dear St.Peregrine- I invited my sister Diane to this Novena whom I was saying it for. It began on our late Moms birthday (who we also lossed to cancer) and I told her we were being sent a message.Today was the closing prayer and tomorrow is her first scan since ending chemo in December, to be used as a baseline during the next month or so then meeting with the Drs to see where they’re at. Again timing. Please please please St Peregrine have this be a positive sign after such a challenging time for my sister and her family. She’s a beautiful talented and funny person who has so much life to share and enjoy with her grown daughters and her husband. Thank you all for including us in your prayers. Stay positive. St Peregrine please help me with this cancer inside me, I pray to you often and I pray you will help me. Please pray for me and others with this disease. Thank you St Peregrine..
Dear St. Peregrine, please help and cure me, I have rhumatoid arthrities and now on stage 4, my legs are now deformed, please help me that i can bear the pain especially if i am walking. Please help and pray for me and also others who have cancer. Dear St Peregrine Holy Servant of God powerful intercessor please pray for healing of my leiomyosarcoma ovarian aggresive and rare type of cancer.. Please give me hope and strength to face this suffering and offer it to our Lord Jesus…Please guide me and give me wisdom for my treatment that it will be successfull.. I know God is in control and everythings is in Gods hands… I also pray for my familys health, blessings and protection…May the Lord God give me another chance to live my life longer so I could continue my purpose to follow him and bring heaven on earth.. This is my prayer. Amen. Although it has taken 4 – 5 years, our Glorious Trinity has healed me physically, emotionally, mentally and spiritually from many years of serious mental illness. Praise God for his mercy and grace. I have grown in my faith and said yes to all I could discern that was his will. Healing has come through a commitment to daily mass, adoration, confession, rosary, Chaplet, Catholic radio and more devotions including novenas. The spiritual healing has occurred during this novena to St. Peregrine and on the feast of St. Francis de Sales through the ministry of my confessor and spiritual director. I believe that God is calling me to a ministry to those who struggle and suffer with mental illness and to those who have dabbled in new age practices. I understand the connections now. I await this new phase of my journey with open hands and heart. Lord give me strength and courage. Amen. My Jesus, my Father, I pray that all who are suffering with illness of any kind help them to recover and be well…I pray also for my niece Katie who has lost both her legs due to the shellfish bacteria…she is only 26. Help her to seek You more and to live a happy an joyful life! I suffer from a stroke please make me alright,my mother Vivienne has a swelling on her foot please cure her in JESUS NAME AMEN. Please bring a cure for cancer. Bless all affected by cancer and giver them strength. Here the prayers in my heart. Bless all who pray the novenas. Thank you for time may lord bless you all and your precious family. Please pray for me because I have a spiritual affliction. Thank you.